• U.S. caught moving men, materiel to Russian border. While the mainstream media in the United States fixated on a war of words between Republican presidential candidate Donald J. Trump and a female news reporter, sparks that could ignite a real war appears to be taking shape along Russia’s borders and in the air over Eastern Europe. Over the past few weeks, the Pentagon has been quietly moving soldiers and heavy weaponry into several countries that line the western and southern portions of Russia. In response, Russian President Vladimir Putin has ordered his military to initiate training maneuvers in these areas to keep a close eye on the United States and the North Atlantic Treaty Organization (NATO). On the ground in Europe, too, all the signs are that both sides are preparing for war. Armed conflict could begin in response to as little as an unintended collision between heavily armed units on the borders between Russia and NATO’s Baltic partners such as Estonia, Lithuania or Latvia, a collision in the air over Europe, or a stand-off between naval forces in the Baltic or Black seas. With tensions at their highest in decades, it might not take much to set off a chain of events that could quickly convince one side or both that war had begun. There is now stark evidence that there have been at least 40 close encounters of a very dangerous kind between the two sides since Crimea voted to join Russia in March 2014. According to the London-based European Leadership Network (ELN) think tank, whose board of directors includes General Vyascheslav Trubnikov, a former head of Russia’s foreign intelligence service, large war games could lead to an all-out conflict. On May 14, for example, a U.S. surveillance plane was chased out of Russian airspace by Russian jet fighters into Swedish airspace. A month later, Russian strategic bombers held a drill in the Labrador Sea close to Canada to practice for the day they might have to fire nuclear cruise missiles at American targets. A Pentagon decision to place extra U.S. troops, heavy artillery and 250 Abrams main battle tanks in the Baltic states of Lithuania, Latvia and Estonia, as well as in Bulgaria, Poland and Romania, drew condemnation from Moscow. Russia responded by moving more military assets and troops to the borders of the Baltic states. The U.S. has also increased its surveillance capabilities in Europe, especially the numbers of drones in NATO’s arsenal. In addition, it has upped the number of high-altitude spy plane flights over Russia and expanded satellite coverage of Russia’s borders. One of the intriguing features of the march to war is that the NATO states most hawkish in demanding increased NATO assets are those sharing borders with Russia, as well as Poland and Bulgaria, who were once under Moscow’s rule, with Poland playing a more prominent role in NATO’s military strategies. The jitters are not limited to Central and Eastern Europe. On April 10, 2015, “the defense ministers of Sweden, Norway, Finland, Denmark and Iceland said northern Europe must prepare for possible crises or incidents because of Russia.” Sweden and Finland are not in the trans-Atlantic Alliance, and Russia was clearly concerned by their rapprochement to NATO, whose foreign ministry released a statement. “Unlike in previous years, the Nordic defense cooperation positions itself as a foe with respect to Russia, with the potential of undermining the positive constructive relations established over the last decades,” it read. For an assessment of why this shift within NATO is happening, and what its consequences are likely to be, this newspaper turned for advice to a former British adviser to NATO, who spoke on condition of anonymity. Missing from mass media and military reports is the threat to civilian air traffic in many parts of Europe, and in the Atlantic, as military aircraft from both sides play their games of chicken across air corridors reserved for passenger traffic. Although the matter has been discussed at the very highest political levels, governments have chosen not to publicize it for fear of frightening the public and exposing their own role in it. Should war come between the U.S. and Russia, it is likely that each power would launch nuclear-armed intercontinental ballistic missiles across the Arctic aimed toward major cities. Do not forget that, during World War II, the U.S. destroyed whole cities in Japan and Europe, including Hiroshima, Nagasaki, Dresden and Hamburg, heedless of civilian casualties.
. . . in line with the U.S. Congressional view that Russia must be confronted. Why? Why MUST Russia be confronted? They can’t win and Russia won’t bow so why must it be confronted instead of remaining a “Mexican standoff? War between the two would go nuclear: Russia would respond and not “die to save America:” Mutually Assured Destruction isn’t a fairytale! If an American nuclear 1st strike took out the Russian war machine entirely, Russian nukes would still fly and reach their targets. Dead Hand! What threat does the USA face from Russia that it would choose nuclear annihilation over a loss of hegemony? Nukes are a hoax? What planet are you two from ’cause it ain’t Planet Earth! If we can smash atoms to heat your city, we sure as little green apples can smash ’em to blow it up! So I suggest you two go Google some reputable sites instead. No war today, thank you. Russia doesn’t need to fight a war, they’re getting everything they want anyway, without war. Russia knows the West will not go farther than whining and complaining every time they jump into an area. Russia will end up with the Middle East in their hip pocket without a world war. Besides, they make money trading with the West, they don’t want to kill the golden goose. With the kind of leadership we have had the top since Ronald Reagan, I have to ask the question does any of this surprise you? Our military has been used to help make the Military Industrial Complex richer at he expense of the American taxpayer. Presidents like Clinton, and this piece of garbage we have now, see the Military as an organization for their social experiments and tearing down long-established principles that have made our military and nation great. The American military, in spite of what has been done to it, is still a formidable force to deal with in the world. Russia is not as formidable as you think. They are in decline like this nation. Their population is declining and there aren’t enough babies being born to replace the older generation. Their men are drunk a lot on vodka and they beat their wives and neglect their families. President Putin has his problems. There is China on his eastern border that wants a little of that land that Russia claims that belongs to them. I would not be surprised if tensions really don’t get really beyond the straining point. It has happened in the past, but you never heard anything about it. As long as you have the Hillary types that are still stuck in the past and the Bush types that get us bogged down in wars we can’t win, our nation will continue to go down that path of decline and mediocrity. Whether or not we put this nation on a better path will have to be decided and acted upon by the American people. As long as we sit on our butts and watch the parade go by, it will only get worse! As much as I hate it, nuclear fission exists. It is NOT a lie or a hoax. Controlled nuclear fission is how we get our electricity from uranium. UNCONTROLLED nuclear fission is a bomb, just like conventional bomb is UNCONTROLLED chemical reaction of various chemical compounds. So, where is my proof? Well, since many footage of nuclear testing on the Internet will be dismissed as Hollywood production propaganda, I will give you the seismic data .Every time nuclear weapons are detonated, it leaves a seismic wave form on a detector. (just like when there is an earthquake, we get a seismic wave form). This is how we monitor for example, when North Korea tested their first nuclear weapon and also to verified that indeed, they did produce a nuclear weapon. Of course, I am used to delusional and ignorant people being themselves and all the rebuttals will be coming my way. Oh well, those people are hopeless. For the rest of you discerning individuals, do your own research and make up your mind. I agree with the commenter Maya, there is no such thing as a nuclear bomb. This was and still is a Zionist psyop/hoax/propaganda effort started during WWII. Just look at who ran the Manhattan Project, all Zionists to the last monster. And, like Maya says, do a search and look into it yourself…it is physically impossible to smash pieces of any kind of uranium or any other radioactive metal together and release its “atomic energy.” Nuclear fusion has escaped every scientific/technical effort for decades. Relax about the nuke thing, it just simply doesn’t exist. Conventional weapons of the U.S. outnumber Russia by 10-1. Russia must go nuclear if its territory is invaded. The END TIME is behind the corner, highly possible date is 2019/2020. It’s Russia who has in its state logo, George the Dragon slayer. USA is Dragon-Serpent, and hence, the Great Satan, the true EVIL EMPIRE. Reagan, the comic, must turn in his grave. 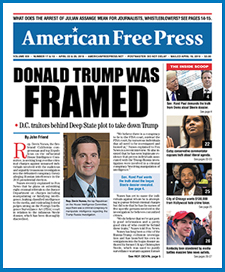 AFP prides itself on being “America’s last real newspaper,” which may be true. But in the larger picture of news outlets, you are weeks and months behind in your observations. The article, in particular, is very old news, and so is its inferences. You need to wake up to the fact that others, like myself, will go deeper into the international news coverage to find out what it happening when it is happening. Yes it’s exactly as planned, I would say. Too many resources to go to waste. Don’t you know the elite aren’t satisfied without it all? I hope Putin whips the floor with NATO, I mean ISIL; same thing in case you’re all too busy drinking the Kool-Aid. Maybe when they’re bombing our kids in our own towns, people will care enough to get off their dumb asses and take it back. Yes folks, it is getting closer and closer to a nuclear conflict every single day and for those that want to survive the radioactive fallout better be prepared to be able to flush the radiation from their contaminated bodies! When this happens it will be far too fast to take potassium iodide which must be taken before a radiation exposure and even then it will only protect your thyroid for a mere 24 hours. The smart detox should be with the natural mineral called zeolite which will remove the radiation and heavy metals after exposure! 1st: THERE ARE NO NUKES anywhere in the world! That’s why U.S. army is approaching Russia with classical army—there are just NO NUKES! But however, it’s really going to be hard for U.S. (that is, U.S. oligarchs’ private paid) army to beat Russian—I’d say impossible, so they better give it up. I am a Senior Army Officer with quite large experience in UN and EU Missions, mainly ex Yugoslavia. I was dealing with the USA geopolitics through all those missions and when fighting for 5 years in Angola and Mozambique. I am quite aware about the USA objectives and its updated geo-strategy to keep its World Hegemony and to reinforce it through the New World Order and the World Government. Everybody well informed knows about it, and who is really in charge in USA, is not the faked Democratic System and the existing Political Power, but the Wall Street Bankers, owners of the economic corporations, the ones from the Fortune 500, Bilderberg Group…all that real shadow powers and, in fact, real Government. Russia + China are now the main obstacles to overcome on the way from USA to the World Government. So Russia and China are to be, either convinced “diplomatically” to accept to become vassals of the USA New World Order or they are to be convinced by force; that is where we are now. The use of force to convince them—but not yet the full military power—just kind of soft powers. USA is pushing Russia against the wall and in a certain way China too, as much as they can, through diplomatic, propaganda/info war, economical, financial and covered political/kind of disguised indirect military operations, like in Ukraine, and at the same time is installing and reinforcing continuously a clear offensive NATO deployment against Russia, which is going to be used as a last resource. Russia and Vladimir Putin know very well what is going on—in Valdai, Russia, last December, Putin said ” Russia is not looking for war and will never start a war, but we are not afraid of it—and we are ready for it.” And added “…the war is almost unavoidable. . .”… that was one year ago.. .today is much more serious. I am a military, so I know Russia has not at all the relative potential of combat to face USA or NATO in a conventional war without nukes; it will be smashed. Russia is clearly aware of it, and Russia not even can think about to go through a 1º face of conventional war and tactical nukes and later, if necessary, nuclear war.. no… Russia has to respond immediately with full scale nuclear war.. and it will do it…unless they are good guys willing to be wiped out from earth. The war in my opinion, unless USA stops its continuous aggressive full spectrum mood, and comes to any kind of compromise—which will never happen—the war is unavoidable. It is going to happen within 3 years; it might be even now. Russian ICBM´s launched from its territory need 20 minutes to reach USA, but from the subs and from bombers they might need only a few minutes. USA will be fully and deeply targeted at once, even if it will be just a retaliation, after a 1rst nuclear strike from USA. USA, believe or not, have no air defenses capable to stop all the ICBM´s from Russia; there will be no winners, just dead people. I believe to be almost impossible to avoid WWIII, just because USA will not give up of its psychopathic world objectives and Russia and its people will never give up to exist as an independent Nation; they are not mental and political slaves like the western European nations. I believe the war will be immediately world full nuclear. And USA and Europe will be both almost totally destroyed by the nukes and by the radioactivity and nuclear winter. There will not be for centuries any kind of chances for life either in USA or EU. There will be some remaining people from EU running away to Africa and from USA to south, and then people from those parts of the world will pay back all the hell USA and EU have done against them for centuries. I believe at this after have been following for many years the anti mankind and psychopathic political behavior of USA—something anti human and very sick controls USA—the end will be the Apocalypse, soon, or now. SORRY FOR THE MANKIND BUT IN FACT WE ARE JUST BRAINLESS PSYCHOPATHS. What else to think about humans who just think about to kill each other. War is absolutely inevitable, all the economic, cultural, social and geo-physical fingers point to it, both in the West and Russia. Russian language news outlets have already reported that War plans for a full spectrum Nuclear response to any NATO Incursion of the RF have already been distributed to all Commands. From America’s perspective they finally get to go to War with someone who can “shoot back,” which will in itself be something of a culture shock after all the third world toilets they have beaten up on since WW2. Suffering from War on their Motherland is deeply embedded in the collective social and cultural memory in Russia, they will unite and continue the sacrifices of their Grandparents to protect their blood and soil. How America is likely to react at the sight of a Nimitz Class carrier ablaze on Fox News with the loss of 5,000 souls is another matter entirely. Incurring massive loss of life of their military personnel is not something America is used to. You only have to look at Afghanistan and Iraq to see their reactions where the loss of two or three soldiers to a roadside bomb or suicide bomber is headline news in America, the loss of 5 or 10,000 soldiers in less than a minute is likely to invoke an altogether different reaction. Such an occurrence will likely lead to massive civil disobedience on American streets with the complete social breakdown that is likely to entail when millions of armed citizens realize their Government has taken them to the brink of destruction. If the United States and its NATO allies are preparing for war with Russia, let me point out just how stupid that kind of thinking is! Russia is NOT some rogue nation full of ill equipped and lesser trained insurgents or militia types, Russia has one of the best trained militaries in the world! They have tanks, battleships, aircraft carriers, and nuclear weapons. They have advanced fighter planes and long ranged bombers capable of reaching United States shores. They have stealth technology and recently just added EMP burst technology to their main battle tanks that can render US and allies tanks useless. Russian Spetsnaz troops with their training make our hardened special forces troops look like wimps! Under no circumstances could the U.S. win against a war with Russia. That is short of nuclear annihilation. Add the fact that Russian citizens absolutely love Putin and about 90% of American citizens hate our current leadership, you’d be hard pressed to convince the average American to enter into war with a former superpower. This idea is pure insanity! We CANNOT win against Russia. The death toll of our soldiers won’t be a few thousand like in Iraq and Afghanistan, it will be in the several hundred thousands or most likely millions. If the American leadership is even considering this action, it’s time for the American people to wise up and take back their country, by force if necessary, and remove those insane leaders from power. I knew it. I knew this was going down like two years ago. People didn’t want to listen. Let’s hope for the best and prepare yourselves. Putin said in June that to attack NATO would be insane. Apparitions indicate Germany will start WWIII, not Russia or USA.